Barry Sears looks at why Americans still have dietary problems in spite of following the advice of experts. Challenging the current recommendations for a high carbohydrate diet, Sears looks into man's history as well as the diets athletes succeed best on, to build a new dietary picture. Anyone looking for better health through an improved relationship to what they eat should put this book on their list. Based on Nobel Prize-winning research, the message is that being fit and feeling good are goals we can reach by eating the right combinations of carbohydrates, proteins, and fats. Though it's hard to think that noodles and bread can make anyone sick or miserable, the author makes a good case that eating too many carbohydrates can mess up the healthy hormone patterns that affect virtually every major bodily function. Dr. Sears is a former M.I.T. biochemical researcher and consultant for chronically ill patients, but the audio's focus is on the practical eating habits of ordinary people. He explains some pretty complex metabolic relationships in a way that sounds easy to apply to one's life. An accessible program with powerful, lifesaving information. T.W. © AudioFile 2002, Portland, Maine-- Copyright © AudioFile, Portland, Maine --This text refers to the Audio CD edition. Creator of The Zone, Dr. Barry Sears is a world-renowned, and widely published scientist and researcher who holds thirteen U.S. patents in drug delivery and hormonal control technology. 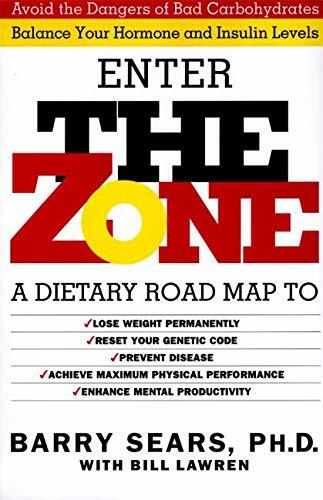 He is the author of The Zone, Mastering the Zone, Zone-Perfect Meals in Minutes, Zone Food Blocks, A Week in the Zone, The Anti-Aging Zone, The Top 100 Zone Foods, The Soy Zone, and The OmegaRx Zone. The Zone Diet is based on a Mediterranean diet which Dr. Sears rewrote to consist of 40% carbohydrates from fruits and vegetables, 30% low-fat protein, and 30% healthy monounsaturated fats at every meal. The Dr. Barry Sears Zone Diet™ is one of the most successful and widely accepted diet philosophies of modern times. Dedicated Zone Lifestyle followers include professional athletes, Hollywood’s elite, leaders of business and government, and even Pope John Paul II. Dr. Sears’ extensive research convinced him of the miraculous health benefits derived from large doses of highly purified long-chain Omega-3 fatty acid fish oil and led to his transformation of the Zone concept into the OmegaZone™ Lifestyle that he believes "...is as close to a medical miracle as we will see in the 21st century."